When I was a kid I wanted to be an attack helicopter pilot. I studied up many popular models, their specifications, capabilities, took the kind of keen insatiable interest that only a child could. My first few trips in a helicopter left me uncomfortably nauseous, and though I later learned that over a third of pilots have to go through acclimatisation to air-sickness, it put me off at the time. Do I regret never having chosen that path? No more than I regret any frivolous childhood dream never being fully realised, and even less so when I consider the sentiment I have towards many of the wars that would have been fought during my tours. Still, like all those boys-at-heart who have dreamt of being a fighter pilot, and consequently took extra pleasure in movies like Top Gun and, more recently, Stealth, I was always looking for a decent helicopter action movie. Of course, it is easier to depict dog-fighting with planes because, frankly, choppers were never really designed to engage in air-to-air combat (Despite Airwolf's misleading concepts). But Hollywood still tried, giving us Wings of the Apache, a lousy and implausible Top Gun rip-off which marked a career low for the likes of Nicholas Cage (aside from perhaps Ghost Rider) and Tommy Lee Jones. But back in 1983, off the back of the poorly-received but perfectly enjoyable (given its effects limitations) Clint Eastwood cold-war spy-plane thriller Firefox, we got Blue Thunder, the only other significant action thriller about an attack helicopter. It's lucky then, that it was so very entertaining. Veteran LAPD helicopter pilot Frank Murphy, may be bitter and disgruntled, and unafraid of breaking a few rules if they are in his way, but he is one of the best at what he does. So he is the top choice when the LAPD's Astro Division decides to test out a new joint-military program to implement attack helicopters for use in surveillance and riot control within the city. Let loose in the “Special”, he soon finds out its full capabilities - using its whisper mode and powerful directional microphones to pick up on the conversation during a clandestine meeting which suggests that the program may be getting the wrong sort of backing. Faced with corruption that goes right to the top, and with no one to turn to, his only choice is to steal the top secret prototype and use it to evade capture until he can expose the truth. Blue Thunder always suffered from the succeeding years, which saw it being adapted for a diluted TV show and being ripped-off for the vapid and implausible (but great fun when you're a kid) Airwolf. Overshadowed by all these offerings, which were much more suitable for children, it often went overlooked and underrated. After all, at the time, it was quite a gritty, tense action thriller, sporting some outstanding aerial set-pieces, held together by what was actually a fairly taut and politically-charged story. Loosely adopting a stance which warned against invasion of privacy - Governments listening-in like Big Brother - coupled with the concept of creating an enemy just to justify the funding for the means to stop it (can anyone say 'WMDs'? ), and Government (tacitly) authorised black-book political assassinations, it may have felt a little like a slightly paranoid conspiracy theory back in the eighties, but it is easily believable in this day and age. Considering Director John Badham's cinematic career probably peaked with this decent offering (although he did give us Wargames and Saturday Night Fever), more emphasis must surely be placed on all the other elements that came together to make things work here. Not least the late Roy 'Jaws' Scheider, who offered us a likeable, tough hero in the form of Frank Murphy. He is a loveable rogue, talking back against his boss, getting into trouble with his estranged partner, and aggravating the men in suits, but - when push comes to shove - utterly determined to do the right thing, against all odds. 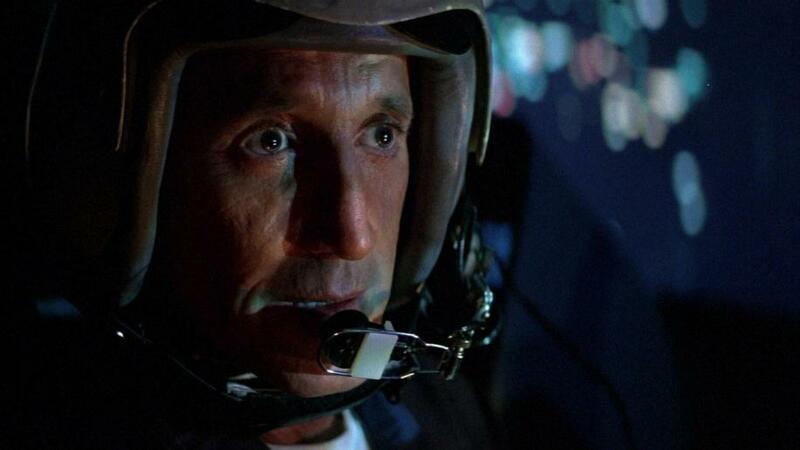 Although he's haunted by the now-clichéd “flashbacks from 'Nam”, even those PTSD moments are given some kind of arc to them, and whilst you may never have expected to see 'Chief Brody' capably pulling off 'maverick attack helicopter pilot', he does so with aplomb. Scheider is suitably backed up by an assortment of familiar faces, all on good form. Malcolm 'A Clockwork Orange' McDowell is on typically nasty, slimy form as his nemesis, Army Colonel Cochrane, who wants to see Murphy go down in flames - one way or another; Candy Clark offers up an immensely bubbly, likeable love interest / partner-in-crime; and Warren 'Bring me the Head of Alfredo Garcia' Oates gives us one of his final performances as Murphy's gruff, beleaguered boss. Even Home Alone's Daniel Stern puts in a competent, early performance as his naive trainee co-pilot, who finds himself in over his head. The story and script written by the guys behind the original, first and joint-best Alien movie, the story itself - whilst deeper than you got in your average action-thriller at the time - was largely just holding things together to allow for some superior aerial sequences. It may have plenty of conspiracy stuff, an intricate plot about uncovering the truth and so forth, but it was still mostly an excuse to have an attack helicopter fly around LA blowing up stuff. Anybody's who's completed any of the later Grand Theft Auto instalments will know just how much fun that can be, and Blue Thunder serves up plenty of action in this department. The boys behind many acclaimed cinematic aerial stunts give us a cannon-armed, heavily modified Gazelle (which looks like a cross between a standard Gazelle and the popular military attack helicopter, The AH-64 Apache) which tears up the streets in the thrilling third act, evading SWAT-loaded police choppers, a couple of deadly F-16 fighter planes and a determined enemy attack helicopter; dodging between buildings, flying beneath the overpasses on a storm drain and even attempting a loop-the-loop (which is entirely possibly in certain helicopters, including the Apache, although I'm not as sure about the Gazelle). Despite the aerial hijinks presented - which, in this CG era offer a breath of fresh air with their innate use of real locations and, mostly, real stunts - the movie is darker than most of its ilk, with plenty of swearing, bone-breaking torture, assault, and even some rather revealing naked yoga thrown in to raise the rating. That said, it is far lighter in tone than what was originally intended - a script pitched with more of a hint of Taxi Driver about it, with an unhinged ex-Vietnam vet' taking to the skies in what is ostensibly a psychotic rampage. Although that would have probably gained the movie more Awards or critical acclaim, the final film is nonetheless infinitely more entertaining - a good, fun action thriller that has the distinctive mark of being all about a high-tech attack helicopter. A 'boys and their toys' classic. Write your Blue Thunder Movie review.